If so, augmented reality learning is the perfect way to improve class participation. It also helps concepts stick, and revolutionizes the educational experience. In fact, it’s already gotten started. Recent statistics show that the augmented reality market will grow to a value of over $ 90 billion by 2020. Read on to discover how augmented reality learning will continue to transform the classrooms of the future. Recent studies have shown that 1/3 of students use their electronic devices more than 10 times during a school day. Yes, for purposes not relating to classes. Figuring out a way to overcome these disruptions often seems impossible. Unless of course, educators use augmented reality learning to work with this technology. Make your lessons more interactive than ever by letting students of any age and within any type of course use their cell phones to participate. Students can download specific apps. These apps let them view models and diagrams on their devices during a lesson. They can even vote on a response, take quizzes, and more within these apps. When you use augmented reality learning to meet your students where they are, through technology that is familiar to them, you’ll see them grasping concepts faster. Today’s students are just as thrilled about the prospect of being transported to another world in the classroom. Augmented reality can take this to a whole new level. Teachers can now use virtual reality to place their students directly in the worlds they’re talking about. You can create the world of the dust-ridden prairies in 1936. Your students can use augmented reality to walk through it. Until we figure out a way to invent the time machine, augmented reality is the next best thing. Augmented reality works to create dynamic sensory experiences that help students to actually interact with the content, not just see it from the outside. You’ll have countless more ways to tell a story, which means that each learning style can be activated simultaneously. This is especially valuable when it comes to skills training, where students can get a hands-on experience through augmented reality without putting themselves or someone else at risk. Companies like Epic Video Factory and Demo Duck create animated explainer videos that engage every type of learning style. You can use these explainer videos to help students to grasp more difficult concepts. Then, reinforce the lesson by using augmented reality technology to let them access the key concepts anywhere they go. As a special education teacher, you know that keeping your students focused is one of the most challenging aspects of your job. Special education students will especially benefit from the gamification element of augmented reality. Unlike waiting for papers to be graded and handed in, gamification provides students with instant gratification. Another way augmented reality learning can benefit both students and teachers? It can make assessing your students’ progress much easier. You can quickly measure how students are progressing in their coursework. 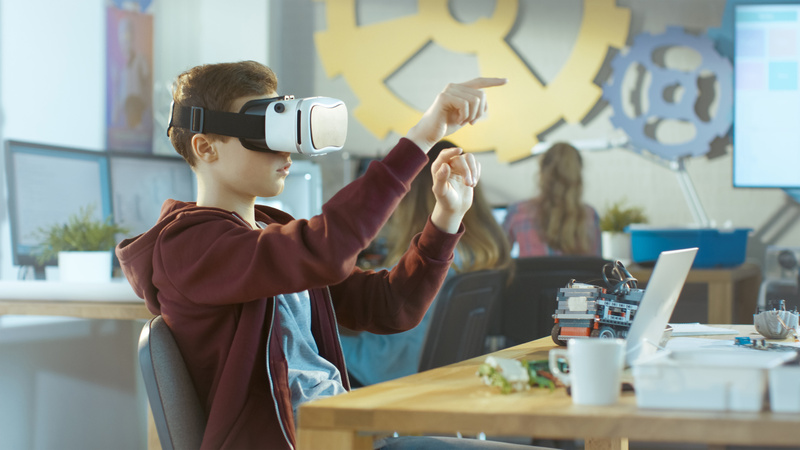 Thanks to this post, you’ve learned just a few of the many ways in which augmented reality learning is transforming the classroom experience. Check out our website! To make sure you’re always ahead of the curve, book a free consultation with us.